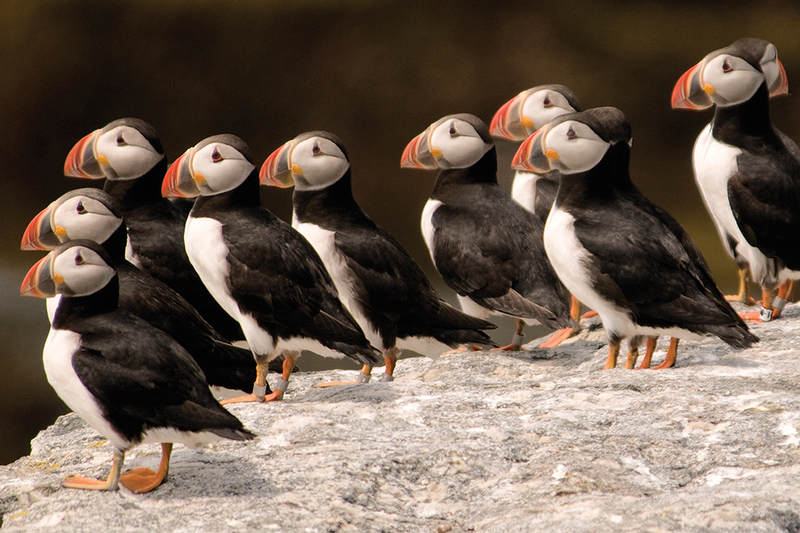 Atlantic puffins like these on Machias Seal Island, Maine’s largest colony, fledge chicks in burrows among the rocks. It’s a testament to Derrick Z. Jackson’s whirligig, renaissance-man career that his substantial talent as a wildlife photographer is only the fourth or fifth most interesting thing about him. Jackson — who lives in Cambridge, Massachusetts, but owns a house in Stow — is a veteran reporter, a Pulitzer-nominated Boston Globe columnist, a fellow at the Union of Concerned Scientists, and a photojournalist who’s shot everything from Green Bay Packers games to the Obama campaign trail. He’s also the co-author of Project Puffin: The Improbable Quest to Bring a Beloved Seabird Back to Egg Rock, co-written with Dr. Stephen Kress, the National Audubon Society biologist responsible for reintroducing puffins to Eastern Egg Rock in Muscongus Bay in the 1970s. 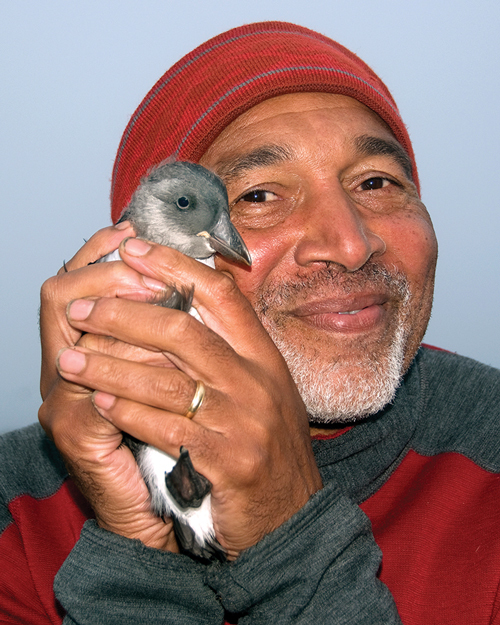 Jackson first reported on Project Puffin’s success in the ’80s, and his relationship to the project has allowed him unique access to Maine’s five protected islands hosting puffin colonies. In June, Jackson teaches a six-day avian photography course at Hog Island Audubon Camp in Bremen. When we reached him by phone, the protean pressman was on the road, supporting (and periodically joining) his wife on a long section-hike of the Appalachian Trail. You grew up in Milwaukee, and you’ve written about having come late to an appreciation of the outdoors. 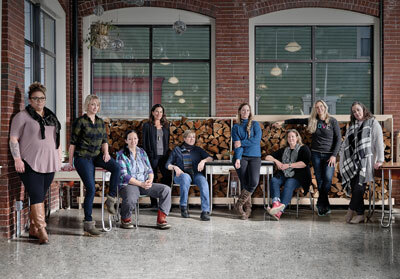 I grew up a typical urban boy, got into journalism as a sportswriter, and knew very little about the outdoors until I met my wife, who’d been a Girl Scout. During our first fall together, she said, “Let’s go see the foliage.” I said, “What’s foliage?” Anyone who doesn’t think they can be a birder or enjoy the outdoors, I am a testament that you can be converted. 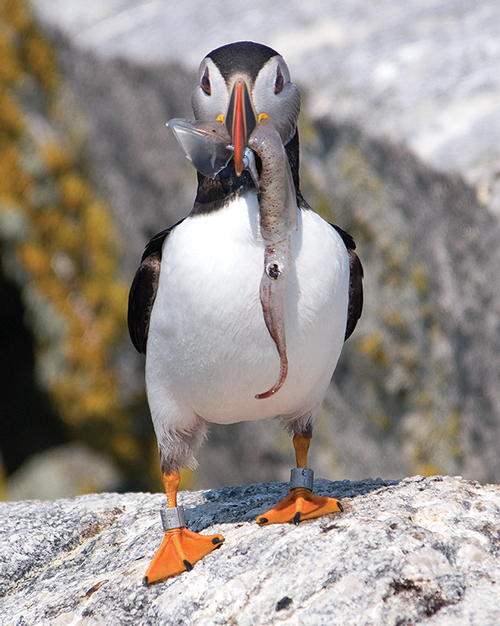 So how did you come to be photographing puffins in Maine? 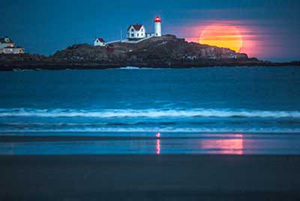 I was a one-man New England bureau for Newsday from ’85 to ’88, and Maine was always my favorite state for its amazing range of both people and landscapes. In 1986, I pitched a story on Steve Kress and Project Puffin. Here was this crazy guy doing something unprecedented — no one had ever successfully restored a seabird to an island. Even then, the project’s success was only five years old. The first confirmed breeding had been in 1981, and there were fewer than 20 nesting pairs. So it was still a very fragile project. 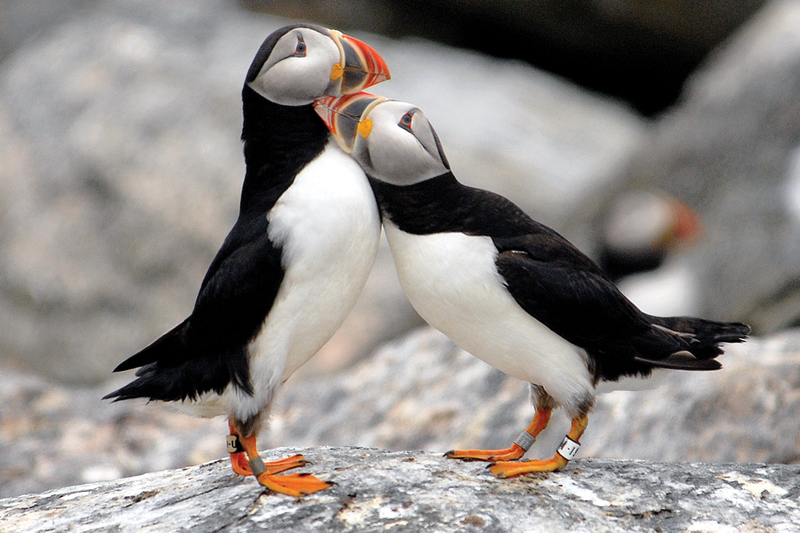 Last summer, Eastern Egg Rock had a record 150 pairs of breeding puffins. You get spoiled by seeing puffins, puffins everywhere. Back then, even seeing one here and there was magical. They captivate you right away: They walk so silly. They bill each other. The best is when they nuzzle — that’s pretty cute. 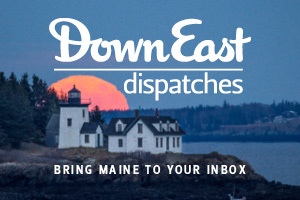 Puffins are now found on five Maine islands: Eastern Egg Rock, Seal Island, Petit Manan Island, Matinicus Rock, and Machias Seal Island, 10 miles off Cutler. 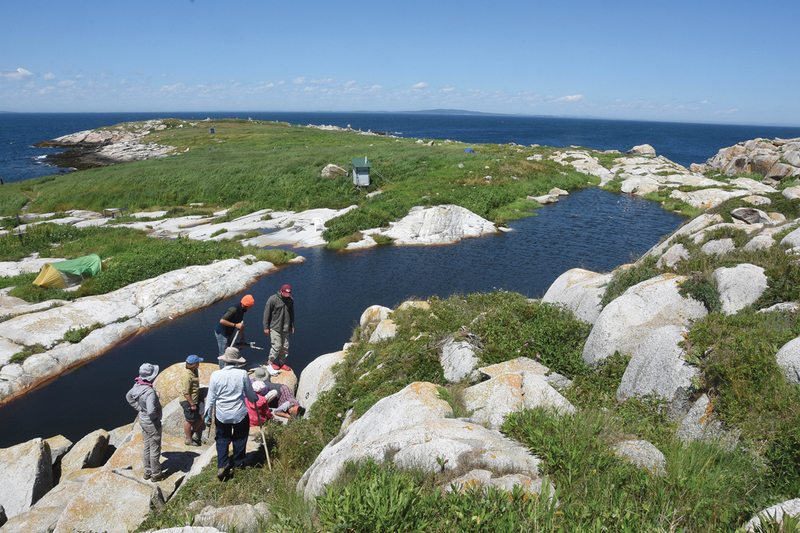 The volatile conditions ushered in by climate change were symbolized last year by Eastern Egg Rock having ample fish and a record 150 breeding pairs, while 120 miles away, Machias Seal Island’s 5,000 puffins had their worst breeding season on record, with few forage fish to be found. 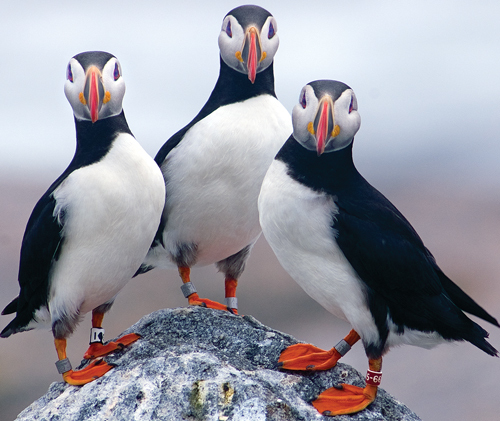 Project Puffin has also restored a colony at Seal Island National Wildlife Refuge since your first visit.  How else has Maine puffin conservation changed? There’s so much behind Project Puffin that people wouldn’t know from just taking a trip around the island, so many things Steve Kress will be the first to tell you he wasn’t thinking about when he conceived the project. He set out to bring back one bird and, in the process, realized he needed a whole ecosystem — a main component being terns, for example, which scare away predacious great black-backed gulls and herring gulls. These days, Steve doesn’t do all the physical work himself. He has all these nimble young adults who can reach upside down into burrows to get a chick to band, scoop up gulls and terns to band, do feeding studies to see how they’re growing. Especially with climate change, it’s inspiring to see young people who may be as dedicated to this going forward. 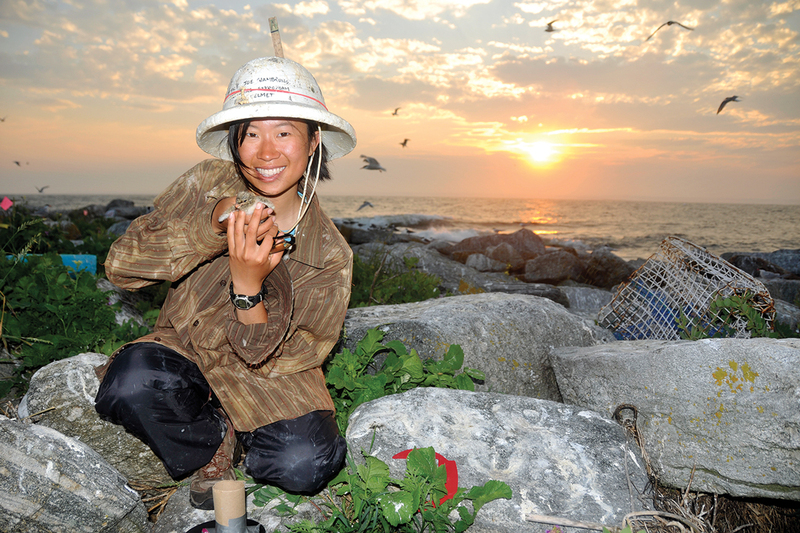 Jennifer Ma, a Project Puffin intern in 2011, holds a puffin fledgling. 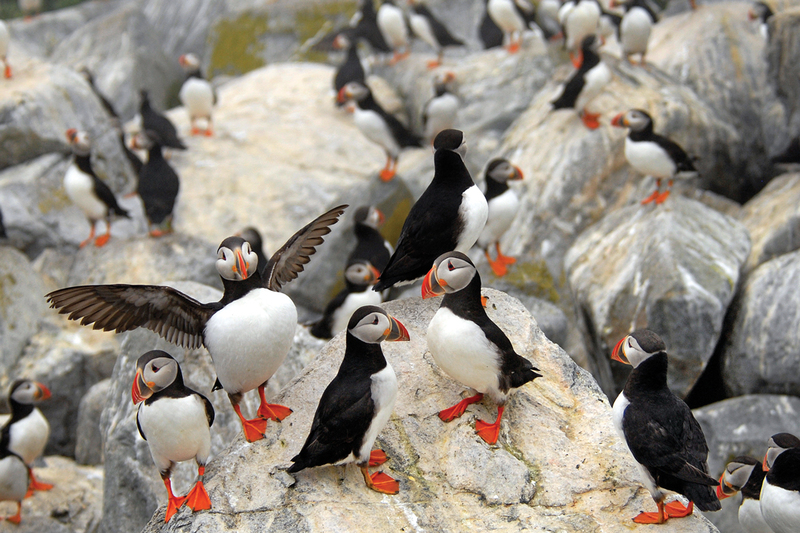 Seal Island was the second island where Kress restored puffins after a century’s absence. Started in 1984, the project had 512 active nests in 2016. From 1973 to 1976, Project Puffin fledged some 240 chicks (from Newfoundland) on Eastern Egg Rock, but no adult birds returned. In 1977, Kress’s team erected decoys made by carver Donal O’Brien. 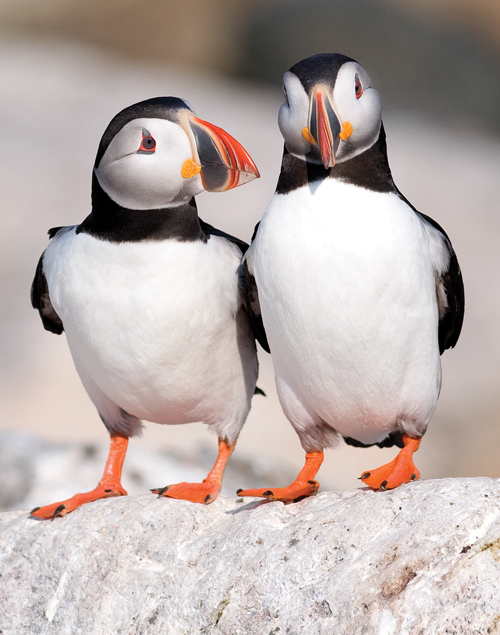 Puffins landed that summer. Decoys have since helped restore seabirds worldwide. What role is climate change playing? 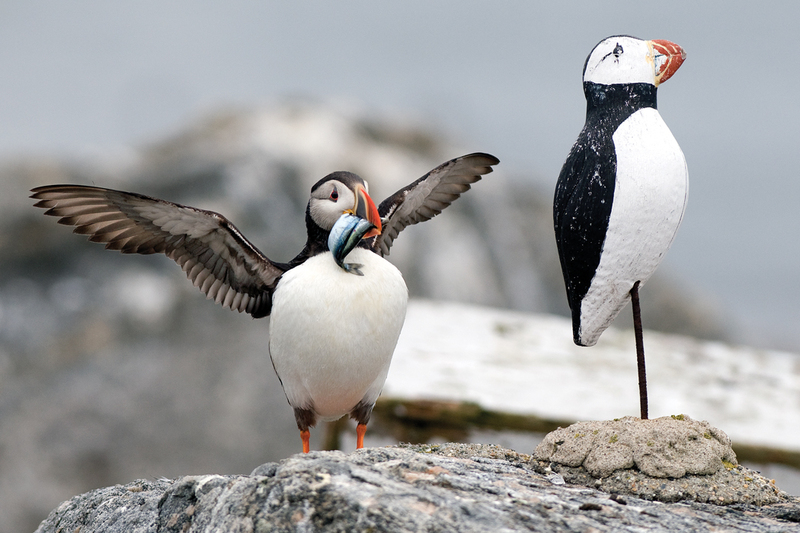 In the last five years, the kinds of fish the puffins and terns bring in have been more uncertain than at any time in the project’s history. 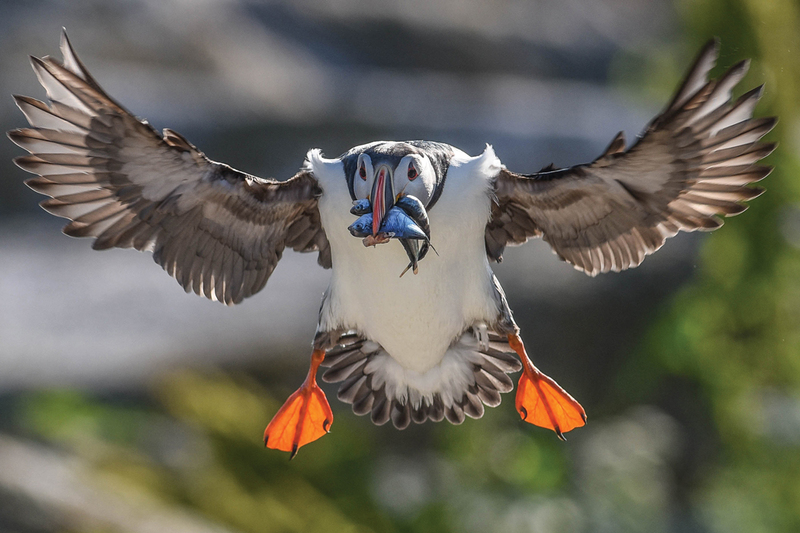 Steve reestablished puffins at the southernmost edge of their North American range, and other species in the Gulf are moving northward almost frighteningly fast — lobster in particular: the core of the lobster population has migrated basically 40 miles north over the last decade. What that means long-term for puffin prey fish like herring and hake, no one can predict. Will it push species that puffins really need out to colder, deeper waters, making it harder for them to find fish? 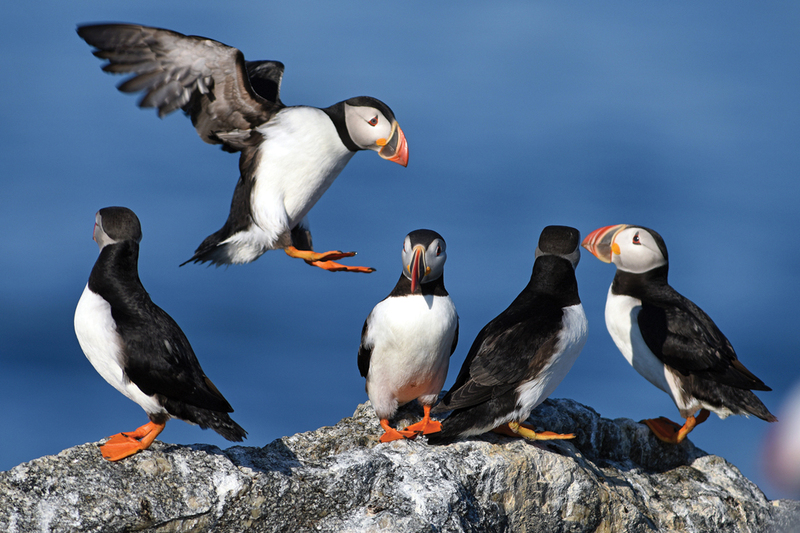 If puffins get lucky, it might push up some species from mid-Atlantic waters that they can eat. 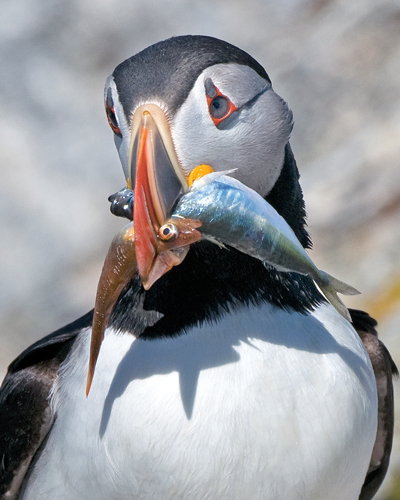 As puffins have more difficulty finding herring and hake, any fish they can get down that’s nutritious is a good thing. Some fish in their recent diets represent the success of our fishing management regimes — fish like Acadian redfish. But also, many puffins are now bringing in new species that are basically death sentences for the chicks, like butterfish and moonfish, both of which are too ovular for chicks to eat. 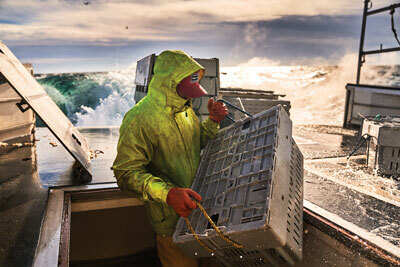 Historically, herring and white hake have been the primary forage fish for Maine’s puffins. But warmer waters have created unprecedented volume and instability in what puffins feed chicks. 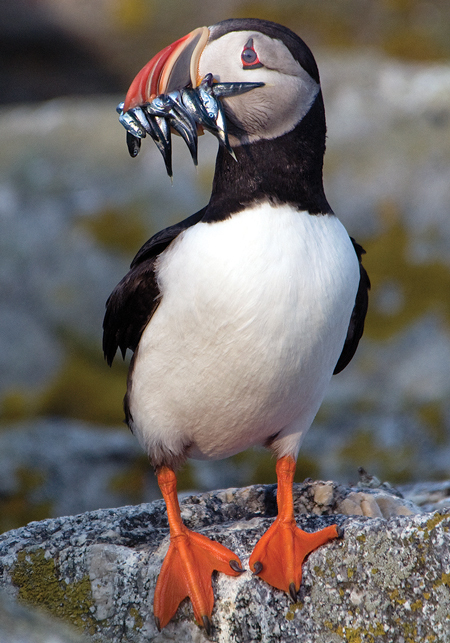 Acadian redfish and haddock, which have rebounded with strict management, are now more prevalent in puffins diets. How did Hog Island’s Derrick Jackson Diversity Scholarships come about? You don’t need me to tell you the conservation world is largely white. What conservationists want is for everybody to care about the environment, but you’re not going to get everybody unless you have everybody engaged. I want to get more young people of color involved, so one way is this scholarship, helping bring educators of color out for a week at Hog Island to take one of the coastal ecology intensives, then bring that learning back to their classrooms and communities. So how does photographing birds in Maine compare to shooting NFL games or presidential candidates? The skills are quite interchangeable — particularly shooting sports and birds, or any animal where there’s movement. The skills you use to capture a receiver catching a pass are the same that you use to capture an eagle landing in a nest. And I actually get to be closer to the puffins than I did to the Obamas. 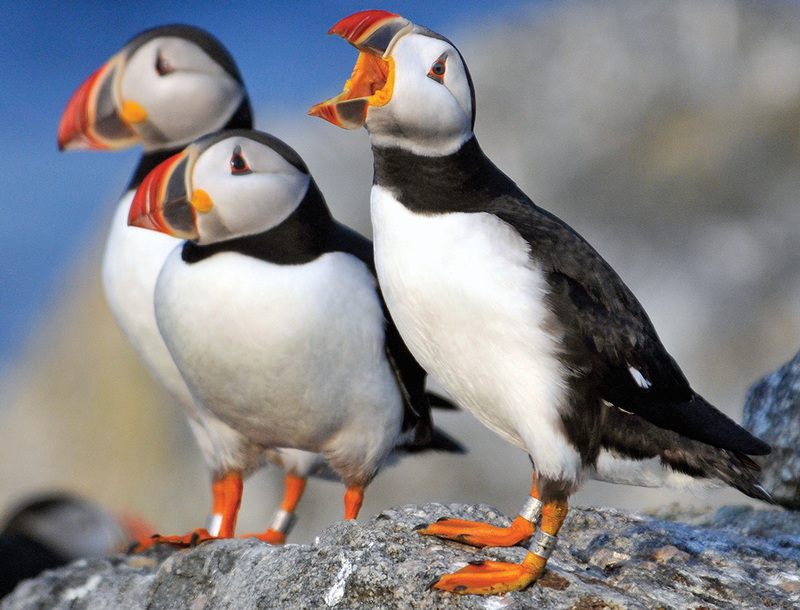 Learn more about Hog Island Audubon Camp and Project Puffin.